The Central Executive Committee of the Communist Party of Canada joins with other progressive and democratic movements in condemning the G7 Summit being held June 8-9 at La Malbaie, an isolated location far from Quebec City. The G7 Summits are not an opportunity for open debates about economic and social policy. These events are an annual occasion for the leaders of major imperialist powers to coordinate strategies to impose neoliberalism, austerity and war on the working people of all countries. Their capitalist agenda includes big new tax cuts for the rich, deregulation, privatization, outsourcing, and union-bashing. 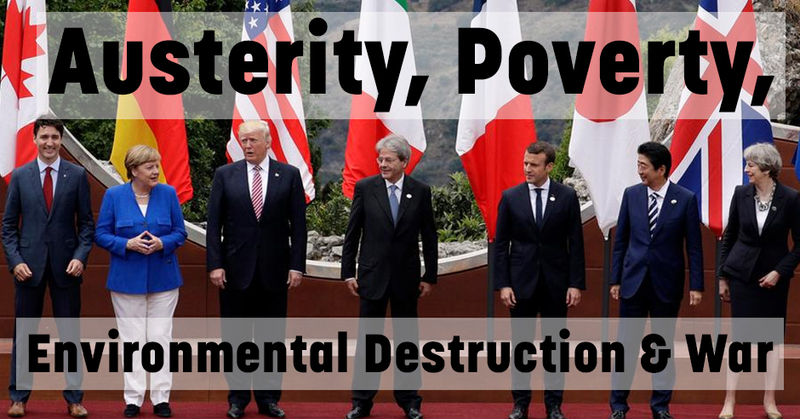 By promoting so-called “competition in public services” and “free trade” deals based on investor-state provisions, the G7 Summits help the richest 1% of the world’s population to maintain and widen social and economic inequalities. In a blatant violation of free speech and the right to protest effectively about the crucial issues of our times, including climate change and militarism which threaten the liveability of our world, the so-called ‘free speech area’ for this Summit will be located almost two kilometres from the Fairmont Le Manoir Richelieu, the luxury hotel where the G7 delegates will meet. At a time when governments claim to lack resources to deal with poverty, homelessness, and the shredded social safety net, this two day summit will cost about $605 million, with $259 million to be spent on security. Making a mockery of Justin Trudeau’s claims to advance gender equality and women’s empowerment, this Summit will be the first visit as President to Canada by notorious racist, sexist, and misogynist Donald Trump, who has also worked relentlessly to sabotage efforts to tackle climate change, and to pour vast new sums into expansion of US imperialism’s military capabilities. The Communist Party of Canada condemns this event as a scandalous waste of resources, and a gathering of imperialist powers, warmongers, environment killers and global capitalist profiteers. We support the protests against this reactionary event, and call instead for policies to advance protection of the global environment, economic security, full employment, human rights, social and gender equality, genuine democracy, and disarmament. Down with the G7 – long live the struggle for a better world of socialism, peace and freedom! Le sommet du G7: un agenda d’austérité, de pauvreté, de destruction de l’environnement et de guerre Trump’s tariffs mean Canada needs a new trade policy now!